Like many of his classmates, Franklin Orfield came to the law after completing military service. During his four years in the U.S. Marine Corps during World War II, Orfield developed business administration skills he later put to use as Business Manager of Balboa University during his time as a student at Balboa Law College. Orfield worked with Holt and other local attorneys on a contract basis before opening a partnership with David Thompson in the mid-1950s. Orfield & Thompson later became Orfield, Thompson & Bunker and finally Orfield, Thompson, Bunker, Sullivan & McGrath before dissolving in the early 1970s. Governor Ronald Reagan personally called the elder Orfield to invite him to serve on the bench in 1969. “Of all of the people you would want for the bench, it would be someone with a multifaceted background like dad,” Judge Michael Orfield says, referring to his father’s experience in criminal and civil litigation. 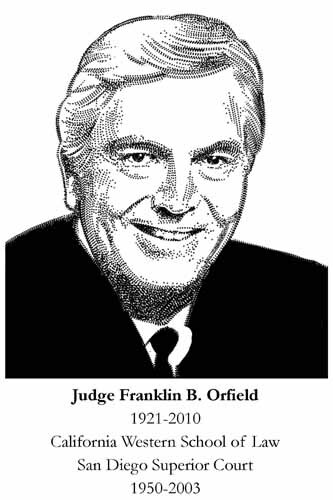 Franklin Orfield served as a superior court judge from 1969-1988, overseeing hundreds of trials including two of San Diego’s longest, the historic Carlin case desegregating San Diego schools and the lengthy murder trial of David Allen Lucas, which remains on appeal to this day. His colleagues elected him Presiding Judge of the San Diego Superior Court in 1976 and 1977. When asked to describe his father’s legacy as a lawyer and judge in San Diego, Michael Orfield points to his professionalism and civility. Even those who ended up before the senior Orfield in court praise his professionalism and demeanor. San Diego television news producer J.W. August recalls the way Orfield put him at ease, even while threatening August and a colleague with jail time for their refusal to turn over material in the Lucas case.